Ever since 1994, Pulsar has been well known for their state-of-the-art designs and utilizing the latest technology in manufacturing products. As a result, it’s no surprise they’re one of the leading thermal scope manufacturers today. Pulsar’s newest thermal scope line that’s due to be released late this summer is the Thermion series. So what’s unique about their latest product offering? Pulsar took everything that made their Trail thermal scopes a success and added new & improved features. But we’ll look into the specifications shortly as we discuss what’s likely to make this line yet another resounding success. We’ll start off with aesthetics. The design of the new Pulsar Thermion line strongly resembles traditional rifle scopes. But the end products will still be a thermal scope - only with less ”boxiness”. These thermal scopes are covered in all-metal housings that guarantee durability and reliability. Though sturdy, the material is lightweight and allows for optimum performance. Within the new range, Pulsar decided to design two models; the Pulsar XM and XP. Let’s have a look at the unique features for each model below. But what’s important to note is; though the two models offer fairly different functionalities, they share a few similar features. First, both models have a high image refresh rate of 50Hz. Also, both scopes can detect heat within the 1350m to 2300m range. Hunters are likely to be impressed with the Hi-recoil resistance rating on this model. It provides up to .375 H&H cal. This means you can use this model on high powered firearms and still expect flawless performance. The thermal scope can also be used with a 12 gauge and 9.3 x 64 caliber guns. Unlike the older thermal scopes that take ages to start up, that’s not the case with this new line of devices. Thanks to the advanced technology utilized in the making of these units, the thermal scope will start up almost instantly. Apart from saving you time, the quick start-up functionality also saves energy, meaning you can use the device for longer before battery power runs out. The scopes come with standard mounting rings with a diameter of 30mm. These rings are best suited for medium-sized thermal scopes. And you don’t need specialized tools to set the unit up. The Pulsar Thermal line of thermal scopes gives you the option to either capture a still image or record a video depending on your intended purpose. Both functions allow you to share the thermal action quickly and easily. With an internal memory of 16GB, you can store hours of videos and countless photos. You can also handle recoil flawlessly. Pulsar ensured that this product provides you with digital convenience. The thermal scopes are supported by a Stream Vision App that allows you to stream to your tablet and phone via Wi-Fi. A dual battery system is convenient for enhancing the thermal scope’s performance. This thermal scope holds a second battery that allows you to effectively power the unit for even longer hunting trips. IPX7 waterproof rated: You can use this model in wet conditions without damaging the unit. Even after immersing the thermal scope in water for 30 minutes, it’ll start functioning without any problems. Variable digital zoom: With these new thermal scopes you can now zoom into images up to 8x, providing you with more focus. High definition image: The device produces sharper images. This high definition functionality ensures clear identification of images including small details like leaves. Customizable recital options: The unit offers a wide range of color customizable reticles. Common color options include green, black, red and white. User-friendly controls: Operation of these Thermion scopes is now simple and intuitive thanks to the three function buttons which allow you to manage all device menu options & systems. Picture-in-picture: This functionality allows the device to display a clear magnified image of the general field of view. This, in turn, allows for precise shot placement. Zeroing profile management: The thermal scope can store up to 5 zeroing profiles and also offers 10 distance coordinates you can opt to use depending on the situation. Full-color HD AMOLED display: Thanks to the AMOLED technology, the thermal scope provides high-resolution imaging and power saving capabilities. Upgradable Function: The new thermal scope has the ability to upgrade the firmware as soon as updates are released to enhance performance and potentially add additional features. Operating the device will be a breeze thanks to the simple user interface. You’ll find the controls quick and intuitive. Like all Pulsar thermal scopes, this unit allows for an extended heat detection range. This means you can spot images from afar with ease. The riflescope offers a wide range of color customizable options; 15 reticles with up to four colors. This allows you to see the images with clarity. With a 16GB internal storage, you can store many videos and over 1000 pictures. By connecting the device to Wi-Fi, you can stream the images onto your phone using the Pulsar’s Stream Vision app. The unit has an IPX7 waterproof rating, so feel free to venture out in rainy or snowy conditions without risking damage. 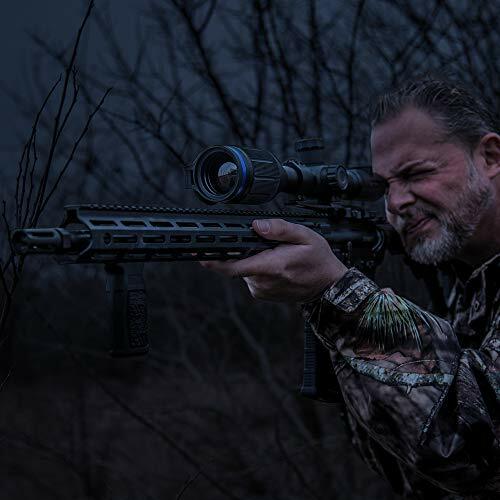 The Pulsar thermal riflescope has a 320 x 240 resolution which allows pictures to be displayed with clarity and a 50hz refresh rate. And the 4x digital zoom ensures the same image clarity. The detection range is 1700 which is not the highest but more than enough for most hunting situations. This Pulsar XM50 model offers more or less the same functionalities as the model reviewed above. After all, Pulsar is very consistent in designing quality products. The biggest difference are the optics with the XM50 having 5.5-22 lens and 4x digital zoom for longer range shooting. As mentioned earlier, these riflescopes are mounted onto 30mm mounting rings including this model. Most of the features are the same as found in the XM38 model. This includes the IPX7 waterproof rating and customizable reticle options. The unit will still function even after 30 minutes of water immersion. The Thermion XM50 also features a dual battery system where you’ll find two batteries inside the unit; on the internal and external front. The external battery gives you more operation time and the best part is it can be replaced in only a few seconds. With this device, you can record videos and capture still images depending on your preference. And it also has a 16GB internal memory capacity so you can store hours of videos. The main difference compared to the XM38 model is that this unit has a larger detection range of 2300 meters. With such impressive functionalities, we’re certainly looking forward to the release of these next-generation thermal scopes from Pulsar. Which one is right for you?